Nashville wants a Megabus stop too. After all, it only makes sense. Knoxville has one. Memphis has one. But, neither connect to the other. The blog reader who wrote in pointed out that Nashville would be a great stopping point for Amtrak. Basically, Nashville seems to want more travel transportation options. Riders in Knoxville and in Memphis seem to be hooked on Megabus. Maybe it could be a travel option for Music City? Another huge benefit of Megabus travel was pointed out to me. No TSA. No pat downs. No abused six year olds or little old ladies in the airport. Heck, the bus company will even let you bring your own snack and bottle of water aboard. That combined with free WI-Fi? Why fly? Oh yeah, we have to. Cars and planes are the primary ways to travel in and out of Music City. Daily, there's a lot of traffic going from Knoxville to Nashville. I'd be willing to be that plenty of cars head to and from Memphis to Nashville on a daily basis. That sounds like a possible business opportunity to me. Coach USA, we really hope you're listening. 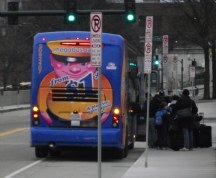 Nashville wants a Megabus stop too. Is there any way to arrange this? We hope so. Want to read more of my articles on this sought after bus service? Be sure to read here.